Biogel Eclispe is the Biogel's newest generation of latex surgical gloves. The new formulation provides a softer feel compared with traditional latex medical gloves. Biogel reports that the Eclipse surgical glove is 30% softer than standard latex surgical gloves. 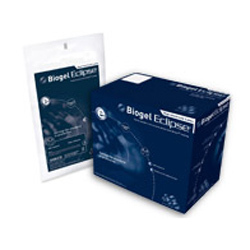 During the manufacturing process, Biogel reduced the levels accelerators used in making the Eclipse glove. Using less accelerators during the manufacturing process can help users of latex gloves become less apt to allergic conditions. It is important to note that the Biogel Eclipse surgical glove contains natural rubber latex and anyone who is sensitive to latex proteins should not use this. Rather, this latex surgical glove is great for surgeons who have no reaction to latex because the Eclipse lowers the chance of eventually becoming sensitive to latex when compared to standard latex surgical gloves.